Now that the wedding is over, I am about to get my eat on!! I had pasta last night for the first time in I don't know when. Great timing as it was just announced that one of our favorite chefs-David Burke is partnering up with the delicious Crumbs Bakery. When Megan and I went to BlogHer12 in New York City, it was during restaurant week and we reached out to David via Twitter alerting him (forewarn is more like it) that we would be coming in for a visit. Not only was it one of the best meals I have ever had, but he hooked us up with Teddy who took great care of us. Read about our fun time and the dishes we had here. As we are on our way to Boston for some R/R AKA as a honeymoon...I sadly will just have to wait patiently until the mid-June launch. I am sure one of their cupcakes will help pacify me! Crumbs Bake Shop, Inc. (NASDAQ: CRMB), the nation's largest specialty cupcake retailer, today announces a co-branding agreement with Chef and Restaurateur David Burke, well known for his inventive modern American cuisine, to create and produce an exclusive line of fresh gourmet sandwiches and salads. Launching in mid-June, the lunch menu items will be sold at select Crumbs locations in Manhattan and the NYC metropolitan area, with the intention to roll out to other markets. David Burke's line of premium sandwiches and salads will bring greater depth to the Crumbs assortment and offer customers fresh and delicious lunch options in addition to Crumbs' cupcakes and baked goods. Additional beverage offerings and chips will complement the new mid-afternoon fare. 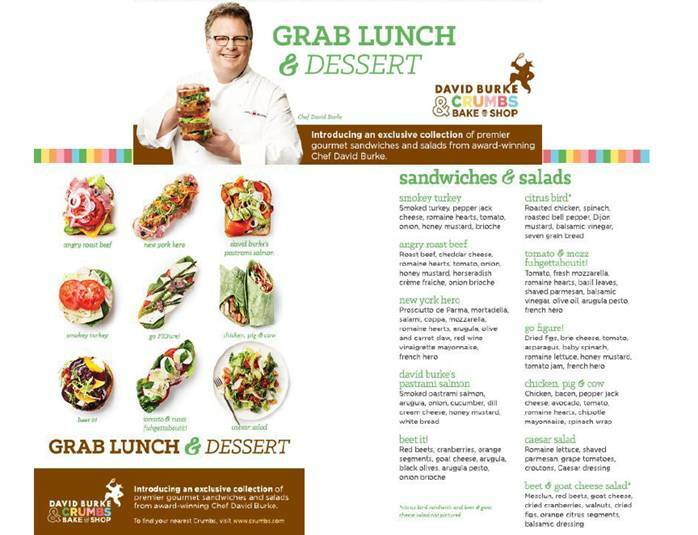 "Consistent with our goal of complementing our already famous assortment of gourmet cupcakes with a choice of high quality and innovative lunchtime alternatives, we are thrilled that Chef Burke will be launching an assortment of gourmet sandwiches and salads for the 'David Burke & Crumbs' program," says Julian R. Geiger, President and Chief Executive Officer at Crumbs Bake Shop, Inc. "Chef Burke's culinary creativity and mastery of great food will be clear to all of our customers once they taste what he has created." "I am excited to be partnering with the legendary Crumbs Bake Shop on yet another fantastic endeavor," said Chef David Burke. "Our new line of custom-made, specialty Burke in the Box sandwiches and salads, exclusive to select Manhattan and NYC metro area Crumbs locations, will feature great taste and personality, meaningful attributes to our brand and theirs." Update 6.28.13-Crumbs just released their menu with David Burke! See below! The first Crumbs Bake Shop opened in March 2003 on the Upper West Side of Manhattan and is well known for its innovative and oversized gourmet cupcakes. The Company currently has 70 locations in 12 states and the District of Columbia, including 19 stores in super regional malls. Blurring the lines between chef, artist, entrepreneur and inventor, David Burke is one of the leading pioneers in American cooking today. His fascination with ingredients and the art of the meal has fueled a thirty-year career marked by creativity, critical acclaim and the introduction of revolutionary products and cooking techniques. His passion for food and the restaurant industry shows no signs of slowing down. Love this!!! I cannot wait to try this out. I love David Burke.